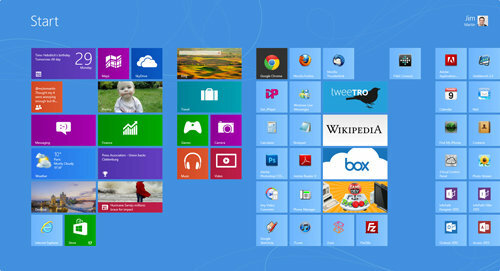 OMG Windows 8 – Tips to not go CrAzY! So I setup my first Windows 8 PC today. Needless to say I have a lot less hair then I did a couple hours ago! I’m not going to get into it all, they changed a lot of stuff. Why I will never know, really, force this new Start Screen, and remove the Start Menu with no option to turn it on. I mean the Start Menu has been around since Windows 95. It works well, we all like it, we all know it, SO LETS REMOVE IT! I do agree that for touch devices its a good idea to change windows, its not touch friendly… BUT most work users don’t touch their screen on the work PC (even if it has a touch screen.) Yes there’s uses for it, so why not have the option to use it or not. 1) Use Windows 7 style – Best for Work Users or Basic users who are used to what they have and know it. 2) Use New style – Best for touch devices, steep learning curve, really annoying if you try do anything you remember how to do, also forces full screen all websites, have fun reading wiki full screen, we take no responsibility for your sore neck. They didn’t do this, I’m sure they had a good reason… HA! These will disable all the headache (the Start Screen) and allow you to have a Start Menu. Then when you have time and want to fiddle with all the windows 8 stuff, you can just temporarily disable the Skip Metro Suite and play, yell, curse and try figure it out. EDIT: Another thing I found is most business users spend 99% of their time on the “desktop” (like windows 7 desktop) so bypassing and disabling the new start screen makes them more productive. The sad part, I visited our Walmart. All the Windows 7 machines had touch screen. All the windows 8 machines were not touch screen, this includes laptops. *my head!!!!! * Wait till you fire up windows server 2012. Yeah I actually just noticed that the other day as well, that the all-in-one touch screen PC’s were windows 7 too! And there was no free upgrade to win 8 from the ones I saw.